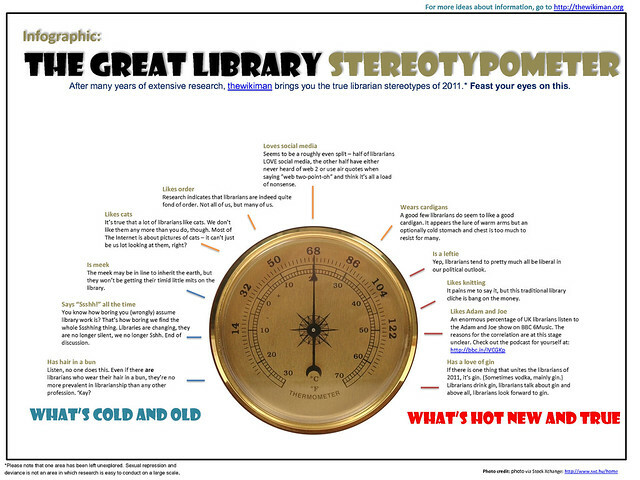 Okay here it is... After EXTENSIVE RESEARCH (I asked people on twitter what they reckoned) I proudly present (and then immediately duck behind the nearest sofa) the Great Library Stereotypometer - a new, up-to-date, piercingly accurate and entirely NON-SERIOUS look at library stereotypes! If you click on the lines between the authors it shows you how many publications they've co-authored and takes you to them if you want to drill deeper, and if you click on any of the co-authors then the whole matrix re-centres on them. It looks really useful and is perhaps indicative of what 3.0 generation library catalogues could usefully do to make navigation easier for users. Next up was me. I have to say it was pretty amazing to be doing a plenary session in front of 250 people at such a venerable institution - one to which I owe my very existence, as my parents met there. I refered to this in my introduction with a 'thank you for having me' gag, and the way the audience responded completely relaxed me - I knew it was going to be fine after that, despite not knowing the bits Laura normally does as well as my own sections, and having added new bits and a re-structure for this presentation. I've never spoken to that many people at once before, and I've certainly never used a screen that big - it was literally about the size of my house! Although I don't really get nervous when I present, I do worry about the technical side of things - I need to know, in advance, that everything is working, or I get stressed. I was really glad I asked that we check everything was okay before the conference began, because both times that Alex removed his laptop so we could hook up the 'general' one most of the rest of us were using, it didn't like the Projector and took ages to display on the big screen. Thankfully there was a break before my talk during which we could iron this stuff out. Having got up at 4:45am I was worried I'd be tired, but adrenalin and the four-shot coffee I'd had at the station earlier carried me through. It was great to do this presentation to a crowd that was really mixed in terms of age, seniority and so on, and who weren't all familiar with what I was talking about - sometimes I fear Laura and I preach to the converted ABOUT preaching to the converted. The talk went well, I remembered everything I wanted to say (I think) and it really was far better not using notes than the New Professionals Information Days where I did use notes. People did a fantastic job of tweeting the presentation - you can read the twapperkeeper archive here - and really got the points across well, which is good as I didn't have time to amplify this event myself by setting up any auto-tweets. People were really kind in what they said to me afterwards, and there was lots of positive feedback. It was particularly good to hear a lot of people say they found the presentation fresh and engaging even though they'd read about it all on this blog, on twitter etc, in the past. Because I really believe in the echo chamber idea and its importance, I was really pleased that many of the afternoon sessions referred back to it - I think the concept stuck. As ever, if you're interested in reading more about echolib, there is a Netvibes page with all sorts of information in one place. After lunch there was about a million mini-presentations around the theme of working together in Cambridge (by and large, the more senior the presenter, the less likely they were to run to time...). I particularly enjoyed Katie Birkwood (@Girlinthe)'s talk about Open Libraries in which she made excellent use of Prezi (and an exclamation point therein, in particular) and talked very entertainingly; and the Graduate Trainees' presentation; and the summary of the TeachMeet movement which began via a speculative tweet or blog post fuelled by wine. (The movement did, not the summary.) There was excellent use of theatre in a very good talk about the Fresher's Fair (and the funniest use of the phrase 'unexplained chasm' I'd ever heard) from the twinkly-eyed and very laid-back Huw Jones. I also very much enjoyed Andy Priestner's look back at Cam23, and some random aerobics (with kissing noises) he made us do in the middle of the session! There was a theme running through a lot of these sessions - or rather two related themes. Firstly, many of these projects and movements came about because someone just decided to 'do it' - I've talked before about how much I think we all can just achieve things ourselves now, often via the web2 tools available to us, rather than waiting for someone more senior, more influential, or cleverer to do it for us. People just tried to make things happen, and they did, and the things that resulted were a success, and will be repeated. Which brings us to the second theme, which is of the trouble with formalisation. A lot of these projects were and are informally run - there aren't people taking minutes, or even necessarily people having meetings. People just communicate via modern channels, show up on the day and get things done. This malleable model really seems to achieve a lot - it allows people the freedom to act quickly and creatively (and is in stark contrast to the bureaucracy CILIP often gets bogged down in, for example, and it is by no means just CILIP who suffers from this). Voices for the Library seems to be the ultimate exponent of this modern approach, but it's happening all over the place. The problem is, it often becomes quite hard to keep informal when things start working really well. Up-scaling and informality do not often go hand-in-hand. Particularly when money becomes involved, the accountability that results often hampers the very creative endeavour which the funds are rewarding. It's an interesting problem, and not one for which I have a ready solution. "I found ‘supergroups’ notion intriguing – the idea of self-selecting groups that can constitute themselves according to what they want to accomplish. What I found surprising, however, was the fact that no-one in the discussion explicitly acknowledged that this is already happening. It’s happening right there in the discussion, as disparate professionals are coming together to discuss problems and issues that are common to all. I’m fortunate to be involved with another couple of these self-selecting, self-forming groups. The first is LISNPN – the LIS new professionals’ network. Set up by Ned Potter, this is a virtual space where hundreds of new – and not-so-new! – information professionals are gathering to talk, to collaborate, to share ideas and experiences. The network is independent – it’s not affiliated with any of the prof organisations, it’s run by new professionals, for new professionals. It’s not sector-specific, it’s not country-specific. Most of the users are from the UK, but on one random page of users I also saw members from the US, Canada, Germany, Serbia, the Netherlands, Finland and Nigeria, highlighting the truly international nature of some of the issues facing information professionals. LISNPN has recently graduated from a purely virtual network to involving some face-to-face events. Theses have been social events so far, organised by members. There’s been no approval to get, no committee to go through, no worries over the target audience – just an idea of ‘wouldn’t it be nice to meet-up for a drink and a chat? Let’s do it! Everyone welcome!’. Does this sound like a profession that’s fragmenting? To me it sounds like a profession that is embracing its differences, and finding its commonalities." I love the message of hope in this! And I think it is relevant to the formalisation debate, too. Perhaps the answer is that we need both informal and formal groups, as both serve their purposes and allow their opposite to function more successfully, too. There are some more blog posts about the day, from Annie Johnson, from Katie Birkwood, from Libby Tilley, and from Sarah Stamford - let me know if I've missed any. *Okay, no one is calling it that. Just me. I've been approached by Facet Publishing to write a book on marketing modern libraries. It's intimidating (the previous Facet book on libraries was written by Terry Kendrick, who is a marketing legend and a member of the Marketing Guild and all that stuff) but a really exciting thing to be a part of. The idea is for it to cover all aspects of the nuts and bolts of marketing libraries - the grass roots - and to cover a wide spectrum of sectors, too. Although the echo chamber theme will pop up here and there, this isn't a book about marketing the profession (or the industry) - it's about marketing your specific library. So, I would absolutely love to hear what you think you'd like to see in such a book. Each chapter will be on a different theme, and they'll all feature a case-study. I'm yet to finalise the proposal with Facet, so if you can give me your ideas quick I'll try and make sure they're addressed! What else would you like to see in there? Would you want more than one chapter on web stuff as it is so important these days? Do you think there should be a chapter about advocacy because without it we won't have any libraries left to market, or will the kind of people who'll buy this book not have time for all that? Do you know of a library with a story that would fit any of those themes as a case study? P.S There will be a separate marketing blog and twitter account coming soon, once we've made the final decision on the name of the book. It'll cover all the stuff the book will cover, and also report on any other great marketing schemes happening out there in libraryland. The famous comedian, the library, and the thoroughly modern echo chamber success story! It's not all bad news and problems in the world of the echo chamber, sometimes things work out really well. One such success story had escaped my notice until today (apologies if you already know about this and it's old hat). Frank Skinner is a comedian and broadcaster. He wrote an article for the Times entitled Sorry, the demise of the library is well overdue. I am militantly anti-the-Murdoch-empire, and the article is behind the Times paywall, so I don't want to encourage anyone to give any funds to the evil cabal (who knows, they may well find their way into Fox News's coffers) - so why not read this response to the article, in the Guardian, instead? Anyhow, the response in the library community was typified by Phil Bradley's piece - sniffy of Skinner's worth as a cultural commentator and dismissive of his views. I can understand that. My personal reaction was different, however - I really like Frank Skinner,and I listen to his Absolute Radio show (in podcast form) every week. Moreover, I know from having read both his books that he is a: extremely intelligent (I think people assume his qualifications are honourary ones bestowed on a famous person - but no, he did an MA in English Literature, he used to be a teacher, and his is very articulate) and b: a really, really good writer. Like Seth Godin's before him, Frank's piece was worrying for two reasons - firstly the factual inaccuracies (he said books probably carry diseases - this is a column to order in the Times, remember..) and secondly the fact that his views were probably representative of many (libraries have no role in the modern world). It's not enough just to say he's wrong (which, regardless of my personal appreciation for him, I can see that he was) - we have to address the fact that he speaks for a lot of people. I tried to do something about it, as an advocate of the #echolib approach to responding to attacks on libraries (ie don't just talk to other librarians about how awful it is). My efforts were, admittedly, pretty lame, but I tried. I emailed Frank via the radio show and explained that his views of libraries were one-dimensional and out-of-touch with reality. I provided an analogy with people's views of him - because he did laddish comedy in the 90s and wrote Three Lions, many people think he is a lad with only blokey, basic humour to offer. He can do that, but he's got a lot more to him than many give him credit for. That, I said, is like libraries - we're known for books, and we DO do books, but we also do a lot more than the causal observer would realise. With that parallel in mind, I said in the email, perhaps you could visit a library this week, see what they're really like, and talk about it on air? Anyhow, no doubt the show's producers weeded out the email long before it ever reached Frank Skinner, as it's hardly primte-time Saturday morning entertainment fare to read out on air. Elsewhere in the library world, someone did something a lot better - someone wrote Frank a letter. There's some details here - a Westminster resident called Don Mackenzie wrote to Frank, explained why he thought Frank's views on libraries were misinformed, and then invited him to Church Street Library to see for himself. And Frank accepted! This isn't even a librarian taking action, it's a library-user - library champions really are worth their weight in gold. The library had loads of computers. The general feel of the place was a cross between a clean, efficient secondary school and a cybercafé. No one was whispering. With the staff’s encouragement, I actually joined the library, and proceeded to choose a book. I wanted Tony Blair’s memoirs but that had already been stolen so I opted to reread Nineteen Eighty-Four. At last, George Orwell fans can reclaim the Big Brother franchise. The smiling lady on the front desk pointed towards a machine on the wall. I put my newly issued card in a slot, scanned the book and got a slip showing the return date, which doubled as a perfect bookmark. I’m already seeing that date as a target. I work better with a deadline. Incidentally, I can return the book to any library in the borough and, you guessed it, renew it online. I'd urge you to read the whole thing - and you can, because he's put the whole thing on his website. Yes that's right, it's not exclusively behind the Times paywall. The original piece was, mind you, but the retraction was not. How cool is that? Not only has this achieved the key echo chamber escape (that eluded us with Godin, Newsnight, KPMG et al) of the same audience reading the good stuff about libraries which originally read the bad stuff, but a BIGGER audience has read the good stuff because Skinner thought it important enough to put in the News section of his own web-page. Not only that, but I think a converted library skeptic is actually better news for the profession, overall, than if he'd never written the original article! I really can't tell you how happy this whole thing has made me. :) Skinner has justified my faith in him, libraries have enjoyed a positive media narrative because of the whole incident, and many of our strategies for escaping the echo chamber have been shown to work wonderfully well! w000000000t! That's all I can say. This also relates to the point that I keep harping on about whenever I'm given a platform - all we need to do is ensure that people can make an informed decision as to whether or not to use their libary. Not everyone needs libraries, that's fine. As long as people know what we do and can make up their own mind. Frank Skinner's opinion was based on a lack of understanding of modern libraries - when he obtained that understanding, his opinion changed. We need to do this, again and again, with everyone. The Echo Chamber problem IS one we can all solve! Laura and I did a version of our Echo Chamber presentation at an event in Newcastle a couple of weeks back. We had a shorter time than usual to do it in, so we took the opportunity to make a slide-deck rather than using the Prezi; it isn't as long, and as far as I'm concerned the more potential this presentation has for dissemination, the better. If we make it available in more ways, that's good - particularly in as embedable a medium as a Slideshare presentation; feel free to take this and put it wherever you like (it's on an Attribution-NonCommercial-NoDerivs licence). Laura has also uploaded this to her Slideshare account, and it's featured on Slideshare's Homepage! Woot.